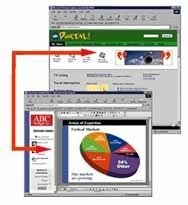 NFuse 1.5 software is a new application portal that provides organizations with the ability to integrate and publish existing, unmodified interactive applications into any standard Web browser. The software is a three-tier product that includes a Citrix MetaFrame server component, a Web server component, and a Citrix ICA client component with a web browser. The software is designed to complement enterprise portal services such as Corporate Yahoo! that provide a centralized "gateway" to corporate information and external content. In addition to publishing applications into a browser, the product enables administrators to personalize which applications a user receives, customize the content around applications, and retain the ability to manage the applications using the capabilities of the MetaFrame application server software. The new release provides enhanced performance with application filtering and caching; improved usability with Web-based ICA client installation, support for UNIX, Java and Windows applications and support for multiple server farms; and enhanced security with SSL encryption and ticketing. Citrix Systems, 6400 Northwest 6th Way, Ft. Lauderdale, FL 33309. Tel: 800-437-7503 or 954-267-3000. Fax: 954-267-9319.